The health benefits eating Spinach are numerous, one of them is losing weight. Spinach can lose folate by 25% if it the spinach is cooked. The best way to retain its carotenoid content is by sauteing the spinach instead of boiling, microwaving, or steaming it. You can eat raw spinach in salads or in smoothies and it will retain its nutritional content. It is a low calorie food. One cup of raw spinach provides 27 calories, 30 mg of calcium, 0.81 grams of iron, 24 mg of magnesium, 167 mg of potassium, 2813 UI of vitamin A, and 58 ug (micrograms)of folate. One cup of cooked spinach can have up to 839 mg of potassium compared to 539 mg of potassium from one cup of banana. One cup of cooked Spinach has 250 mg of calcium. The calcium in Spinach is binded with oxalates, which makes the absorption of calcium by the body difficult. Only up to 5% of calcium can be absorbed by your body, whereas calcium of milk has an absorbance rate of up to 28%. Once the calcium in spinach is ingested, it is easy to attach to bones with the help of vitamin K that spinach has. As a child, you may hear of the famous sailor Popeye! 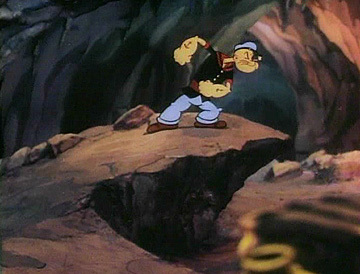 The sailor that famously ate spinach to become bigger and stronger when he needed to fight. There is a great content of chlorophyll in spinach. With the help of other nutrients like proteins, carbs, and fats, spinach helps produce energy in the body. Chlorophyll gives the green color to spinach. Chlorophyll is what gives most leaves their green color. Chlorophyll is stored in a structure called chloroplast. You may remember from biology that photosynthesis takes place in the chloroplast. Chloroplast membranes are made of thylakoids. Thylakoids are made of different proteins and the function is to absorb light and transform it into energy (via photosynthesis). Chlorophyll helps in the prevention of cancer too. Fresh Spinach delays the stomach emptying. This in turn, decreases your hunger by decreasing the hormone Ghrelin in your body, and increases satiety by increasing GLP-1 (Glucagon-like-peptide). This helps the body lose bad fats and maintain a healthy weight. New research is being conducted to know if this can help with the control of diabetes too. Spinach has flavonoids with anti inflammatory properties. Spinach contains the flavonoids spinacetin, patuletin, jaceidin, that produce glucoronide, glucopyranonside. All of these types of flavonoids have anti inflammatory properties for the intestine and the body and can help prevent diseases like cancer. Spinach has small quantities of omega-3 fatty acids that improves its anti-inflammatory properties. Spinach is a rich source of nitrite. Nitrites are used to preserve foods like bacon, but the quantity is too large. More than 10 milligrams per 8 ounces is used to keep bacon preserved. The quantity and quality of nitrites in Spinach are the healthiest. Spinach has less than 1 milligram of nitrites per 8 ounces of spinach. There are studies that nitrite in spinach can be transformed in nitric oxide. Nitric oxide has the health benefits of improving the circulation and heart health. Eating Spinach has a lot of health benefits. It improves eyesight and prevents macular degeneration (vision loss), helps build stronger muscles and bone remineralization, fetal development and growth in infants. The consistent consumption of spinach helps to maintain a healthy blood pressure in the prevention of atherosclerosis and heart attacks. Spinach protects the skin and also helps in the prevention of cancer. With all the health benefits of Spinach, we can not overlook that the people with tendency to produce kidney stones can not eat too much spinach due to the high content of oxalates in spinach. Be sure to drink plenty of water to prevent any formation of kidney stones and consult a health professional if this is the case. Spinach is a vegetable rich in fiber, vitamin K, iron, B complex, vitamin C and other nutrients that will help you lose weight when you add it to a balanced diet. Spinach will help you to maintain a healthy, increase energy, it has anti-inflammatory properties, help build strong bones and improves circulation. Eat Spinach raw or sauteed for better benefits along a healthy diet. Leave a comment in the comment section. Buy the products advertised in this web page through the links and images on the page and get the best price on amazon.com. We are part of the amazon affiliate program and the commissions received will help the web page to continue bringing you articles to inspire and help you to be healthy, lose and keep a healthy weight. This article explains the health benefits eating Spinach . Thank you for your support. Natural green leafs are good for all of us, afforable, easy to find in the supermarket and complement any dish, eating in so many forms, raw, cooked, smothies etc. Thank you for your comment. Yes, spinach is great for being healthy, so many good nutrients !!. Thank you for your comment. Hi James, spinach can be sauteed with olive oil or sesame oil. Even though it is better to eat it sauteed or raw, in salads or smoothies blended with fruit, you can add it to different dishes, cut or blended to rice, soups, stews, even to bakery if you want to add some green color and enjoy some fiber. Oh my goodness!!! I knew I loved spinach, but I guess I did not realize it’s full potential! I usually only use it for salads, I never cook it, so according to what I have read here, that is a good thing, I am keeping all of the goodies. Now to figure out what is stopping it from making me lose weight!. I think this is going to be a page that I will be bookmarking for sure! Thank you so much for all the great information! I had no clue it had so many vitamins in it..sorry, I’m just amazed actually. I just use it because I know it’s healthy, plus it tastes good on my salads. I love spinach. I just know that spinach has flavonoids with anti inflammatory properties. This leaf has a lot of secret. Thanks to unveil and sharing it for us. I really need to lose some body fat because well summer is really close 🙂 I also heard that glucagon like peptide can help. I will definitely eat more spinach after my workouts. Great choice !! definitely, spinach will help to increase glucagon like peptide to curb apetite. Thank you for your comment ! I love spinach, but the problem I have is storing it. It always seems to go bad before I have a chance to eat it all. Do you have any super tips for storing it? Or should I just start using the frozen stuff instead? That is a problem, it is better to eat it as soon as you buy it, the supermarkets tend to have them in a special temperature and humidity. You have to wrap it around with a paper towel before storing it in a double plastic bag or a plastic container, and keep the temperature between 34-48 F to keep it fresh for a week. Wow, that was a very thorough article. I have always heard that spinach was good for you but I had no idea. Popeye was a bright sailor!! thank you for that awesome post about something that is truly good for us. Yes, spinach is good for you, full of nutrients. It can be incorporated in a low carb diet because it is low in carbs and calories. Thank you for your comment. Hi Nieves, this is a very informative post, thanks for sharing, I know green leafy foods are healthy, but spinach seems to be at the top of the list, thanks again for sharing. To all green leafy foods, specially spinach !! Thank you for your comment. Great and useful information. Thank you! It is important to remember that green vegetables are great for our health. Sometimes people forget that. Spinach is one of the best. This year in spring I ate a lot of ground elder (Aegopodium podagraria). I know that this plant is rich in many minerals and vitamins, and I like the taste. :) I think you need to write an article about wild, edible plants. I will look into this, wild edible plants. Thank you for your comment and for sharing your experience with ground elder. Yes, Manika-Nia, spinach does incredible things for the human body. I am glad that is part of your diet !. Thank you for your comment. Wow, that article was sure packed with information. I’ve always liked spinach and knew it was good for me but I don’t eat it as much as I should. I wasn’t aware of all the health benefits it provides nor that it could be eaten raw in a salad. I usually boil it but it’s clear from your article that a lot of the nutrients are lost in cooking so I’m going to start eating it raw. Thank you for the very thorough and informative article. I’ve recently began intermittent fasting to lose weight and am on a low carb diet. I was just thinking this morning what other vegetables I could incorporate into my meals and I had completely forgotten about spinach. Thanks for the reminder. I’ll be picking up some tomorrow at the farmer’s market. If you eat it raw, you can mix it with fruit or other vegetables, with a little bit of olive oil and apple cider vinegar or you can make a juice with some fruit until you get used to the flavor. Thank you for your comment. This is good stuff. I’ve always know, since I was taught as a kid, that spinach is good for us. I guess it’s one of those things that I’ve never really thought too much about because I assumed the health benefits were exaggerated people and cartoons etc. As long as there are good examples, like this, where we can incorporate spinach in to the diet, it makes me more likely to pick some up at the store.